Another great milestone birthday to plan is with these 40th birthday celebration ideas. For 40th birthday parties, it seems that anything goes! Once upon a time, turning 40 was looked on as an adult birthday to dread. But more and more, turning 40 and having adult birthday parties to celebrate are becoming the norm. 40 is the new 30...right? So let's turn our attention to celebrating this great milestone. Turning 40! These are a few of the top ideas for celebrating a 40th birthday. One fun idea is to take your 40th birthday on the road. Take a trip someplace with a one, two or a few of your favorite friends. Popular destinations could be Las Vegas or New York city, a resort or the beach. However, any place can be a great-getaway. Plus a hotel or restaurant you might visit may have fun birthday celebration ideas or packages at their facility. 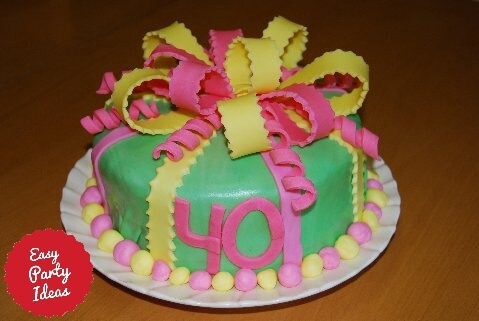 Especially popular for celebrating a 40th birthday are surprise parties. You can plan one at your own home, at a friends home, or at a public place. Whatever you think you can pull off! Parties where you pick a party theme and just enjoy are really fun. Anything goes here. One of the most popular 40th birthday celebration ideas is to celebrate at home or at a restaurant with special friends and family. We've celebrated lots of fun 40th birthday parties this way. Friends and fun. That is what it is all about! A 40th Birthday Cake is a must for your party. Cake looking like books for someone who likes to read. As you can see, any interest or activity can be turned into an idea for a cake. There are lots of other adult birthday cake inspirations on our birthday cake ideas page. Whether or not you have a theme, purchasing 40th birthday party decorations like these available thru Amazon can be a way to set this party apart from others. If you are looking for something to do at your party, nothing can be easier than purchasing some print and play Printable Birthday Party Games! This is the easy party way to go...you purchase and print at home so no shipping fees or trips to the store. There are also lots of great adult party game ideas available on our website that you can play. Just pick one or two and you are on your way to making your party stand out from the rest. After your 40th birthday party, come back to this site and create your very own party page. Share your own 40th birthday party details, complete with photos, that's hosted for free on our site! You'll be helping others who are planning their own party, plus you'll get a chance to record your own party and preserve that moment in time. Have you been part of a great adult birthday party? Share all the details about a great party, gifts, invitations - we'd love to hear all the scoop!